If you spot a python on the golf course, you should probably go to the next hole. Someone should’ve told this wallaby that there's a snake in the grass. According to Yahoo, a 13-foot python was spotted on a golf course wrestling a wallaby on the 17th hole of the Paradise Palms course in Queensland, Australia on Saturday. The days of the golf clap are over. Now is the time of the golf hisssssss. "It had (the wallaby) in a vice-like grip and it was swallowing it," said Robert Willemse, golfer and witness, who later heard that the python finished the job. Willemse went on to say that while wildlife is common in the area, giant snakes were not. "It looked like it might have dropped out of a tree, got a hold of (the wallaby), then there was a bit of a struggle and it rolled into the middle of the fairway." Is no place safe from these monstrous snakes? When it’s time for back to school shopping, it’s good to have your priorities straight, and Liberty University would like you to add “gun” to your shopping list. Look, Liberty University loves all the amendments the same but loves one just a little bit more than the rest. See if you can guess which one. After permitting students to carry guns to campus and encouraging students to take a class on obtaining their concealed-carry license, Liberty University is installing a NRA-approved firing range on campus. And they’re the first college to do so. According to Yahoo, the University filed for a permit earlier this week to build a “nationally recognized, full-scale shooting, training and competition center,” and the NRA offered to help build it. "Last fall, the school's stance on guns attracted national headlines when Jerry Falwell Jr., president of the Christian school, encouraged students to get their concealed carry permits in order to defend themselves against what he said was the threat of armed Muslim attacks," writes Yahoo. His remarks come in conflict with the fact that white terrorists are responsible for more violent crimes on American soil. He also went on to say this terrifying bit of Islamophobia, “I’ve always thought that if more people had concealed carry permits, then we could end those Muslims before they walked in and killed them.” So you can kind of guess where this dude’s coming from when it comes to guns. Liberty University also helped finance the Kirk Cameron-vehicle Saving Christmas, which sits at #2 on the IMDb Bottom 100 — even though it barely qualifies as a film. Driving is the type of thing like chewing gum and walking, you can do two things at the same time. Whether it’s putting on some make up or reading a book, the perfect time to do something else is when you’re driving. Just ask this guy, who decided he needed to live stream his race down the freeway, so followers could get a glimpse at him mugging for the camera and see his car go real fast. What’s weird is that while he was doing those things, he crashed his car. Really bad. This driver, a 20-year-old from Providence, RI, is now in critical condition, and you can see the whole thing right up to the crash on YouTube because he was streaming his collision course. It’s not like people driving and looking at their phone endangers other drivers. It’s not like driving is an incredibly dangerous activity that no one seems to respect at all. Wait, what am I saying? Please stop playing at your phones when you’re driving. The world’s a scary place, but when Slender Man is involved, it gets even scarier. Exploring the sorted history of the Internet folktale Slenderman, HBO’s new documentary Beware the Slenderman details the real-life, horrific consequences of Internet myth-making. The trailer gets into the spread of Slenderman and how a meme can lead to violent crimes committed by children. Part Making a Murderer, part The Nightmare, Beware the Slenderman looks like it’ll be the scariest documentary of the year. Oh, were you planning on drifting off to sleep tonight without a care? Maybe you should turn away now if that's the case. These face swaps are horrifying enough to leave you with nightmares. 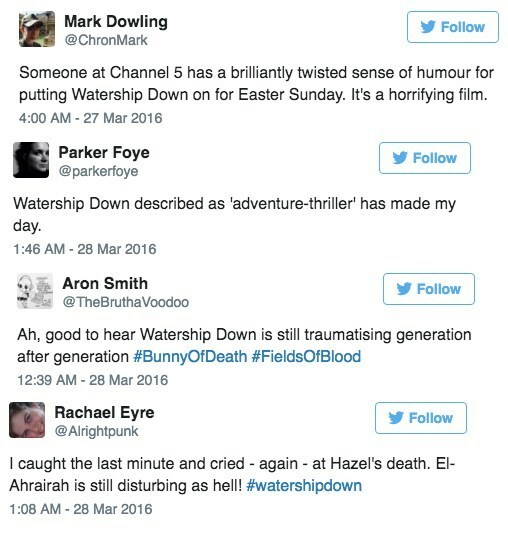 'Watership Down' is a terrifying movie based on a book by Richard Adams about a community of rabbits finding their way in the world. 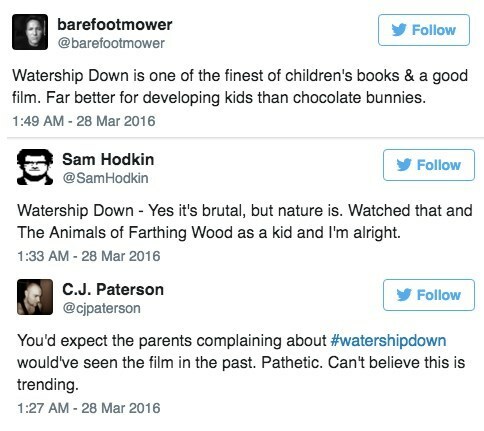 It usually has cute rabbits on the cover so it's usually mistaken for a children's book but the world of Watership Down is brutal and not all of the happy little bunnies survive. But... its about bunnies so that makes it a great Easter film, right? That's what someone at Channel 5 in England must have thought when they scheduled the movie to run in the afternoon on Easter day. Naturally, some families were outraged but others just enjoyed the irony of the programming. Others support the movie and think parents these days are too sensitive. We can only guess that whether they'll show it next year depends on how many parents called complaining of nightmares. Sometimes kids are afraid of the Easter bunny but eventually we all grow out of that. Lots of people have pictures of their smaller selves crying on the lap of an adorable, smiling bunny. Unfortunately, some of us were right to be afraid as a child. These bunnies with make you have Easter nightmares all over again. This toddler was saved by his neighbors holding out quilts for him to land in. Miraculously, he got away without a scratch. According to South China Morning Post, he was trying to get out of the room after locking his grandmother out while playing hide and seek. He was examined by a doctor who gave him the all clear so this story has a happy ending. It happens so fast but the reporter, Alex Savage, managed to jump out of the way in the nick of time. He posted a follow up video on Facebook assuring everyone he was okay and crediting his photographer, Chip Vaughan, with shouting the alert that saved his life. The driver of this truck overcorrected after slightly hitting the other side of the bridge railing. This scary video shows the dashboard view and later inside the truck as it punches through the concrete barrier and lands in a park below. Thankfully, no one was hurt. The park was unoccupied at the time and the driver, who was ejected from the truck, managed to survive after a few weeks of intensive care. The Zika virus is responsible for what the World Health Organization calls a global health crisis. The disease is spread by mosquito bites and can cause terrible birth defects like microencephaly when pregnant women are infected. It's also been linked to the development of Guillain-Barré syndrome, a rare condition that causes the immune system to attack nerves. The first person in Dallas County has been infected with the Zika virus without traveling outside the U.S., becoming the first person to acquire the virus in the country, according to the Centers for Disease Control and Prevention. The patient was infected through sexual contact, not through a mosquito bite, according to county health officials. 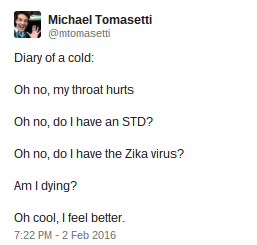 Nature is getty scary, guys, and who better to put that into words than Twitter. There's a tradition, especially in New Orleans, to have a King Cake during Mardi Gras. It's a festive cake with a small, plastic baby hidden inside which will bring you luck if you find it. 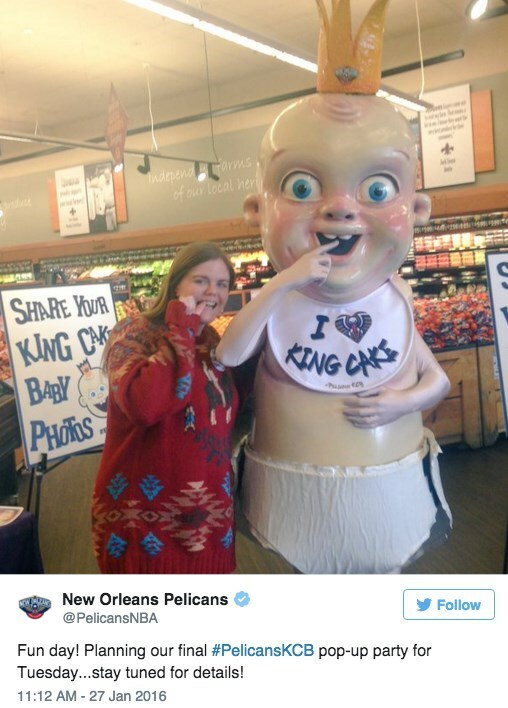 This tradition has translated into the horrifying King Cake Baby, a mascot brought out around Mardi Gras season by the New Orleans Pelicans. 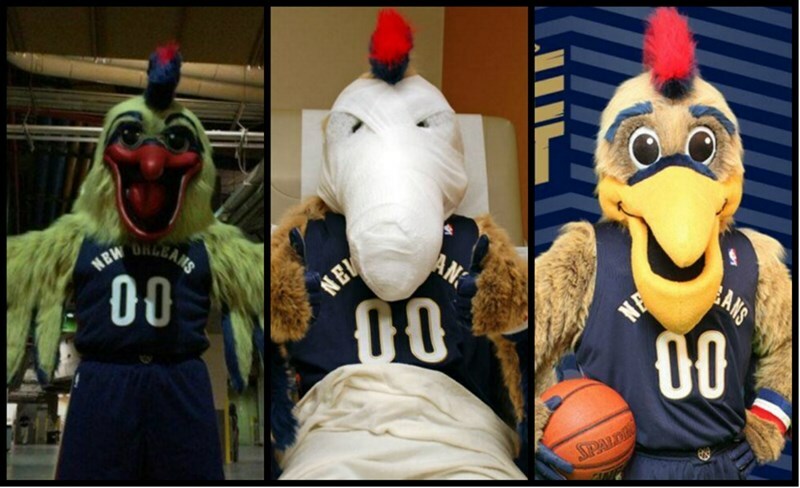 This is coming from an NBA team who recently gave their year round mascot "plastic surgery" to make his face a little less scary. We've been served up some unexpected renditions of the infamous Godzilla; from the box-jawed mother of Matthew Broderick's 1998 version to the more recent 2014 encounter Bryan Cranston had with what might as well have been the mystery beast from Cloverfield. Anyone see that? Nope? Oh, okay. End credits. Great promise lies on the approaching summer horizon with the coming release of Godzilla: Resurgence. This will be the first Japanese Godzilla movie in over 10 year's time. The new dropped photos of the supposed production designs employed to bring life to the newest Godzilla were reportedly leaked by a fan group on Twitter on Saturday. What we have as the best fan theory proposed so far, kind of not really, is that this is the original 1954 Godzilla that somehow managed to start up with regenerating itself. According to i09 this Godzilla is some kind of 'hybrid' design, never until now attempted in a Japanese Production. This production design weds computer graphics with a gigantic tower of a doll of rippling red muscle that portrays much resemblance to that of an anatomy chart.